the cat visconti gogo prototype channel is completely rocking. but it looks a bit strange. 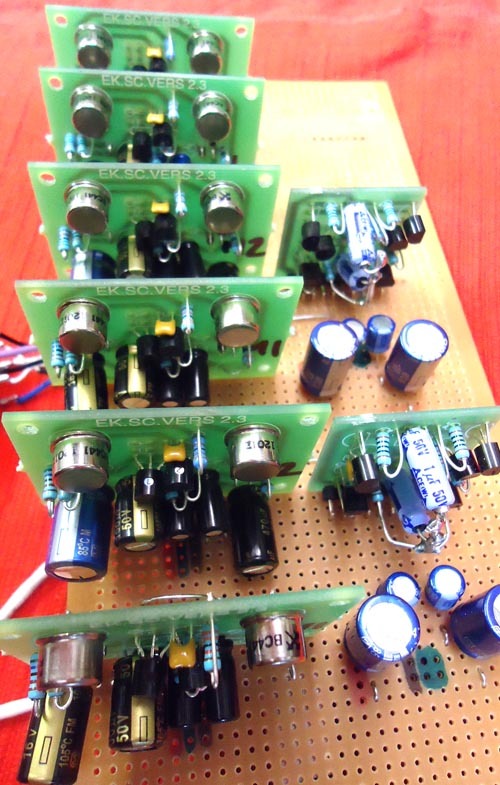 it is just the test bed of amps so far. even with its all unshielded looopey connecting wires and floating switches, the sound is crystal clear and clean of noises or interferences. the trident tsm 4 way -with filters eq design is turned backwards and inside out. now the H.F has new mojo from coming first on top. the L.F needed utter lobotomy. the old chip band pass sweeping eq is changed out for a simple tough and tight 5 freq shelf eq. (neve 1080) much better bass control with no lumps. 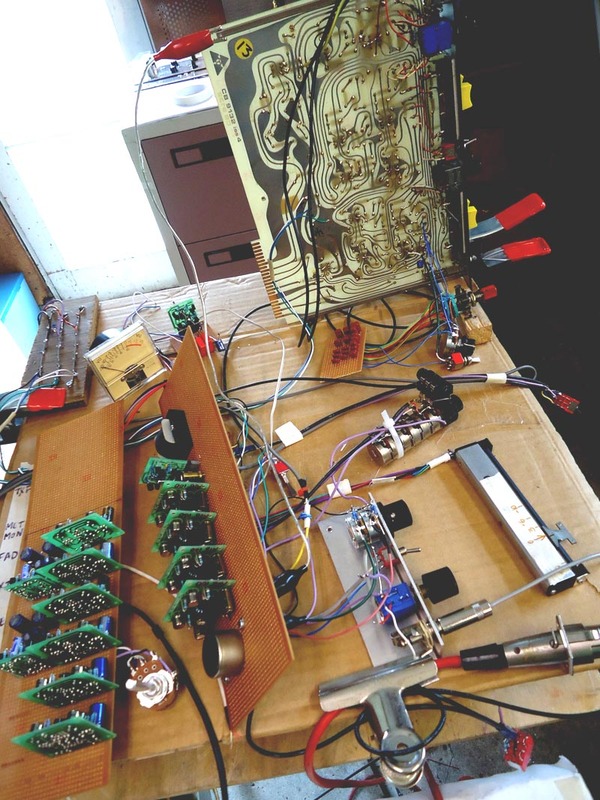 the all transistor channel amplifiers are on this motherboard along with the jensen input and output trafos (ex of other parts of the trident console) . theres two gain controlled amps in series as the mic/line amp. the series gain controlled preamps push the signal so long far forward with no noise – effortless big gain. and then a fader and post fader amp. theres also an amp for the extra input section to feed the extra stereo output buss. so many extras. and then one other dual amp board that creates an isolated clean monitor send for a headphones system and a meter feeder..to . ah. feed the meter. the other mother (r.h)- board is a stereo twin inverting stage buss amp and control room amps and stereo line buffer amps designed to be a recording and monitoring unit for andrew’s loungeroom desktop computer set up. more pictures to come.